Complete dentures or Full dentures are used when all the teeth are missing. They can either be “conventional” or “immediate”. The framework of complete dentures may be made of plastic/resin, metal or a combination. 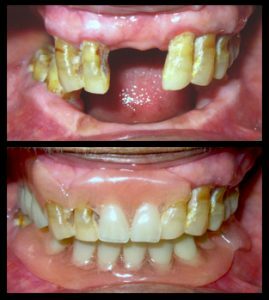 A removable partial denture usually consists of replacement teeth attached to a pink or gum-coloured plastic base, which is connected by metal clasps or precision attachments that holds the denture in place in the mouth. Precision attachments are generally more esthetic than metal clasps as they are nearly invisible. Can’t it be made before 6-8 weeks of healing?